One of my New Years resolutions was to spend less time in bars and more time going to the movies. So yesterday I went to see Broken Embraces, a new film by the Spanish director, Pedro Almodóvar. At the beginning of the film, we meet Mateo (Lluís Homar), a blind screenwriter who prefers to be known as “Harry Caine”. He is looked after by his agent, Judit (Blanca Portillo), and by her son, Diego (Tamar Novas). One day someone from Mateo’s past shows up at his door, and he seems deeply disturbed afterwards. Diego demands that Mateo explain why. After some initial reluctance, Mateo opens up. He tells about how back in 1994 he directed a film called Girls with Suitcases (this was before he went blind). 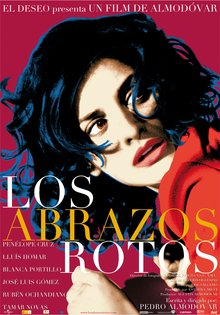 The film stars an actress named Lena (Penelope Cruz), who is the mistress of the film’s producer, a wealthy financier named Ernesto Martel (José Luis Gómez). Ernesto’s creepy son, Ernesto, Jr. (Rubén Ochandiano) wanders around on the set with a video camera, ostensibly doing a documentary. During the filming, Mateo and Lena fall in love with each other. Just as you expect, Ernesto learns about their affair from watching his son’s videotapes. In a jealous rage, he pushes Lena down a flight of stairs, causing her to break her leg. After the film is done, Mateo and Lena run away together. Ernesto then seeks to exact revenge on the both of them. Throughout this film, Almodóvar maintains a careful balance between comedy and seriousness. The light-heartedness of some scenes is contrasted with the violence (both real and threatened) in others. The result is a funny, suspenseful, and ultimately moving story about a man finding peace with his past and with himself. One of the many strengths of this movie is the very good acting. (Penelope Cruz is wonderful as Lena.) I highly recommend this. This entry was posted on January 23, 2010 at 9:04 am and is filed under Cinema. You can follow any responses to this entry through the RSS 2.0 feed. You can leave a response, or trackback from your own site. Nice touch reviewing the films watched. Is it just me but I can’t seem to take my gaze away from that film poster. Maybe it’s just the colours. My New Year’s Resolution is to watch a new film everyday. I only mention what I think about a film if I’m prompted in the comments box. Bit lazy, I know. Recommendations welcomed. Preferably on dvd. Our 15 month old stymies any attempts at going to the cinema. Thanks for the kind comments. As a graphic artist I must say it is a very well designed poster. Watching a new film every day? I envy you.